The Quehanna Wild Area is the largest state forest wild area in the state of Pennsylvania, covering just over 48,000 acres and boasting herds of native elk, the largest stand of white birch in the eastern United States and an interesting nuclear history. In the 50’s, the land that would eventually become the wild area was developed into a nuclear jet engine test site by the Curtiss-Wright Corporation. The area was fenced into a 16-sided polygon, so on maps, the Quehanna Wild Area is shown as a circle. The Wild Area was established in 1965, after the state reacquired the land formerly purchased by Curtiss-Wright, but the nuclear reactor and hot cells weren’t demolished until 2009. *If you’re interested in learning more, the Wikipedia article about Quehanna is actually a great place to start. Several forums like this one offer a mix of legit information and entertaining conspiracy theories. Now, Quehanna is an off-the-beaten-path haven for hikers, cyclists and naturalists. The 74-mile Quehanna Trail passes through the Wild Area as well as Moshannon and Elk State Forests (FYI: it’s hiking-only). There is also an abundance of multi-use singletrack, snowmobile trails and dirt and gravel roads to be explored. I’d had my eye on this region for a while, and the urge to explore it grew even stronger after the Moshannon-Quehanna Purple Lizard Map was released and I spent hours poring over it on the kitchen table. When a bike riding acquaintance/future friend Emma asked if I wanted to do a bikepacking trip there at the end of February, I didn’t hesitate to say yes. The plan was two nights of self-supported camping with one full day of riding and two shorter days on each end, with emphasis on exploring all the “modern ruins” in the area – Kunes Camp, the nuclear reactor and jet engine test sites, and old CCC camps. Fast forward to the week of the trip: The forecast didn’t look great, with rain and temps in the 40s all day Saturday into Sunday morning, but both Emma and I were too stubborn to suggest we reschedule for a different weekend. Instead, we decided to spend the first night at Quehanna Motor Lodge so that we could get warm after riding in the rain all day, then go camp Sunday night after a hopefully drier day. The driving rain was less than inviting when Emma and I met at the Motor Lodge on Saturday morning. After a few hesitant glances at the sky and each other, we decided to hoof it instead of ride bikes. It would be easy to stay dry and warm on foot, and then we could go check out some of the modern ruins that were on hiking-only trails. First up, Kunes Camp – a cabin constructed in the early 1900’s that used boulders as two of the walls. The roof rotted away long ago, but the concrete walls, floor, crumbling outhouse and various bit of the former woodstove remain. On our hike to find the cabin, Emma and I got to know each other better. It’s always a gamble agreeing to an overnight trip with someone you barely know. We’d met briefly at a bike festival, followed each other on social media for a while and exchanged a long chain of emails about this trip. Luckily, the match seemed to be working out as we chatted about work, relationships, life and adventures. As someone who can have a hard time tearing down my own personal walls, forays into situations like this are something I’ve been trying to force myself into in order to grow as a person. Upon arriving at Kunes Camp, we were filled with awe. It sounds unassuming, but the sight of a cabin actually built against boulders in the middle of the PA woods is pretty darn cool. Wide-eyed, we clambered around like little kids, climbing atop the boulder walls and peering into the crevasses that spanned the width of the giant rocks. Exploration complete and Modern Ruin #1 checked off the list, we started to make our way back to the Quehanna Highway, which bisects the Wild Area. Next stop: The remnants of the two nuclear jet engine test sites, which were located at the very center of the Quehanna polygon. The jet engines were strapped to concrete pads and it was claimed that if one ever broke its moorings, it couldn’t escape outside of the polygonal area (this theory never actually had to be tested). The test sites also included concrete bunkers (because occasionally the nuclear enginges would explode), one of which is currently overgrown and filled in with dirt, but the other is still standing. We found the overgrown one first and weren’t sure what we were looking at until we found a small opening confirming that it indeed used to be one of the bunkers. The next was much more obvious, a concrete square, painted black. A few graffiti artists had made their mark on the structure, but there weren’t as many tags as I would have expected from such a perfect canvas. By the time we finished poking around, we were getting hungry and evening was setting in, so we made our way back to the car and the Motor Lodge, where we hung our soaked clothing in our room with the heat blasting and headed to the Lodge restaurant for dinner. This was only the beginning. Nice article Helena. 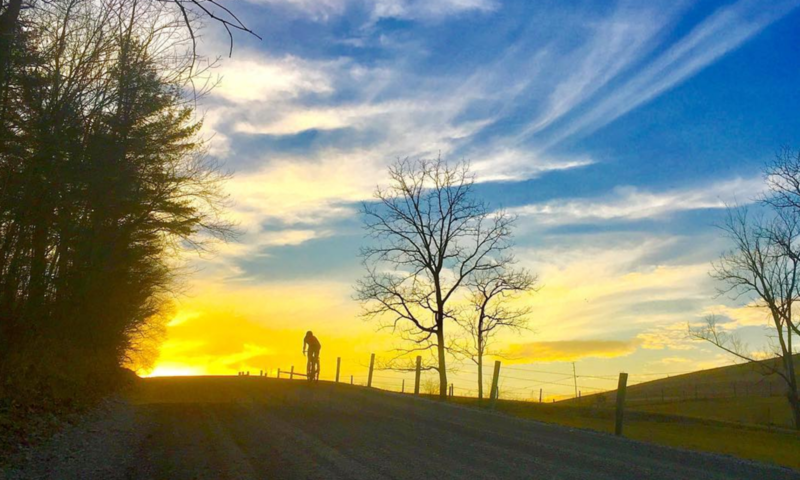 By the way, we have a huge group coming to State College April 27,28,29 for a Rothrock Ride on Saturday and the Coopers Gap Epic on Saturday. If you are interested, contact Josh Royston. jroyston@selectrehab.com You will likely know a lot of these folks. You and Evan should come. I think I heard about this ride! One of the folks in the Friends of Coopers Gap group (Craig Matthews) posted about it on the FB page to see if anyone wanted to go. I’d love to join for one or both. Wow, seeing ruins like that in a somewhat “normal” wooded area must be kinda spooky! And good on you for taking a leap and pushing past your comfort zone. It was actually just what I needed to hear because I am in a similar situation, planning a bike tour with someone I don’t know super well and it’s really exciting but also a bit nerve wracking. My father worked at Curtis’s wright, I have 8mm film of the jet engines actually running and being tested. I spent many hours as a teen in the building that housed the reactor which was the largest concentration of Cobalt 60 in Pa. He told me many stories and showed me many places where they buried chemicals, some nasty stuff. Wow, that’s pretty interesting. Thanks for sharing! How far does,a person have to walk to see the old bunkers above or below ground. From where u would park? The bunkers are probably about a quarter mile off the main road. You can hike into them via on old paved road that is now closed and gated, but it makes for easier walking than on a trail. You are not allowed to ride bicycles on yellow and orange blazed trails in the Quehanna Trails system. Please follow the laws or spend a week fixing up the trails you ruin. Betty, if you actually read my post you would realize that we were hiking, not biking, on the orange and yellow blazed trails. We only biked on gravel roads. Previous PostPrevious The Mile Run Trail Challenge. Next PostNext A weekend in Quehanna, part 2.